While there has been much talk about a “new” United States policy toward Afghanistan by President Obama , the truth is that it is fundamentally no different than that of President Bush . The Obama administration’s strong emphasis on a military solution and the continued use of heavy force are leading to more civilian casualties and the further alienation of the Afghan people. The fighting must end if peace, stability, and sustainable economic development are to come to Afghanistan . A sharp distinction must be made between Al-Qaeda and the Taliban, and meetings must start with the latter to work towards a political compromise and agreement. Peace for Afghanistan can only come through the Afghan people and with their support. Afghanistan does not have ten years to start the peace process. It must start now with discussions and a full appreciation of the complex realities of Afghanistan , its culture, people and society. While there has been much talk and discussion about a new United States of America policy toward Afghanistan by President Obama ’s administration, the truth is that the “new” policy is fundamentally no different than that of President Bush . U. S. policy towards Afghanistan over the last century has suffered from a serious lack of understanding of the country, its people, culture and society. By ignoring the very real and very large differences between the culture and society in the United States and in Afghanistan, the Obama administration risks falling into the same trap that the United States fell into when it helped the Mujahidin fight the Russians thirty years ago and set the scene for a violent civil war. The Obama administration’s strong emphasis on a military solution and the continuous use of heavy force in military operations are leading to more civilian casualties and the further alienation of the Afghan people. Instead of recognizing on-the-ground realities and launching grass-root outreach programs, the United States is coming up with grandiose plans, which are failing. This misunderstanding is leading to growing Afghan mistrust of American, NATO, and ISAF forces. The fighting must end if peace, stability, and sustainable economic development are to come to Afghanistan . A sharp distinction must be made between Al-Qaeda and the Taliban, and meetings must start with the latter to work towards a political compromise and agreement. The misperceptions of the United States and the international community must end, with a better understanding of Afghanistan ’s politics and society. Once these realities are recognized, negotiation with the Taliban and Golbuddin Hekmatyar can take place. Peace for Afghanistan can only come through the Afghan people and with their support. The current heavy-handed military approach is not working. Afghanistan does not have ten years to start the peace process. It must start now, with discussions and a full appreciation of the complex realities of Afghanistan , its culture, people and society. The failure of the United States policy in Afghanistan is due firstly to the continued American misperception of Afghanistan ’s politics and society.. Secondly, with the signing of the Bonn Agreement, the United States empowered the same elements, i.e., the Northern Alliance and other warlords who were the main parties responsible for the destruction of Afghanistan and for introducing factionalism, political violence, and warlordism. With the rapid overthrow of the Taliban regime, the Bush administration provided military and financial assistance to elements that it could not control or influence. Thirdly, American military actions in Afghanistan such as the indiscriminate bombardment of villages, the killing of innocent civilians (offering their relatives blood money, as if this could compensate), the illegal entry and search of people’s houses, and searching Afghan women is creating resistance and animosity towards the Americans and other foreign troops in Afghanistan. Finally, the lack of political and administrative reforms, the deficiency of reconstruction and sustainable economic development, and the absence of social justice caused by a lack of responsibility and accountability, compounded by corruption, bribery, NGOs, foreign contractors, warlordism, and the drug mafia is gravely undermining the current regime. This actually helps the reemergence of the Taliban in Afghanistan . The themes identified above will be developed in this article in the overall historical context which is important to understand the failure of the United States ’ policies today. Before discussing the details behind the failure of the current American foreign policy in Afghanistan , it is important to review the historical and geopolitical factors that affected policy-making both in Afghanistan and in the United States . These perspectives will explain the geostrategic position of Afghanistan and American foreign policy toward this country. This historical discussion is important because it provides us a review of the conduct of American foreign policy toward Afghanistan from the 1920s on. It also helps to understand that the decision-making process of this period, which laid the foundation for future relations, was influenced by personal and situational factors. Throughout the twentieth century, American foreign policy toward Afghanistan was marked by a lack of information, misinformation, misconceptions, and disinterest in Afghan culture, politics, and society. The United States ’ foreign policy-makers failed to understand Afghanistan ’s culture, values, and norms, which impacted the decision-making process in Washington . The landlocked and remote country of Afghanistan was not considered to be culturally, economically, and geopolitically important. Tom Lansford argues that “ Afghanistan lacked the strategic or resources interests necessary for inclusion in the core band of states considered vital to US security.”  Furthermore, “Americans misperceived Afghanistan being a remote, Kiplinguesque land inhabited by wild, ferocious tribes whose members were lawless, xenophobic religious fanatics.”  Influenced by Eurocentricism, policy-makers in Washington saw Afghanistan as a hostile culture not relevant to its own interests and cultural values. Time and again, policy-makers in Washington have accepted this picture of Afghanistan as being politically convenient without questioning the accuracy of this description. This behavior continued from the 1920s until the 1960s, when the United States realized that it had lost Afghanistan to the Soviet Union . In the twenty-first century, especially after the American invasion of Afghanistan , there was a general expectation that the United States would not repeat previous mistakes and that policy-makers would be able to prioritize foreign policy goals in Afghanistan . It was also expected that the United States would be able to identify the existing and potential sources of conflict and problems in Afghanistan and design a plan that would not only help Washington to achieve its foreign policy goals, but also help establish a sustainable and reliable government in Afghanistan . However, the policy-makers in Washington continue to misunderstand Afghanistan , its people, its priorities, and its politics. The Bonn Agreement with its disparities in power distribution, ethnic representation, inability to distinguish al-Qaida, the Taliban and the average Afghan as well as indiscriminate bombardment of the innocent people are just a few examples. In other words, the American policy-makers have not learned from their past experiences and mistakes. This flawed understanding of Afghanistan is why current American policy is failing and why Afghanistan will, without some major adjustments in policies, likely return to a failed state run by a drug mafia, rife with factionalism, internal fighting, and warlordism. The policy-makers in Washington , D.C. , and especially Wallace Murray , ignored Louis Dreyfus ’ recommendations and continued the policy of not opening a diplomatic residence in Kabul . Their decision to ignore Dreyfus ’ recommendations was based on misperception and uncertainty about Afghanistan ’s social, cultural, and political structure. Murray was not interested in searching for evidence to confirm or reject Dreyfus ’ recommendations. His search was selective, which, according to decision-making theory, is described as bias in decision-making. Murray was interested in hearing and collecting facts and information that supported and confirmed his conclusion and disregarded facts and information that supported different conclusion. Despite new information and new circumstances, Murray was not willing to change his old thought patterns. After Afghanistan ’s independence in 1919, the main focus of Afghan policy-makers, as with all states, was the maintenance of their country’s independence and national security. Afghanistan tried to achieve these through mutual recognition and noninterference in the internal affairs of other countries. At the same time, Afghanistan tried to modernize its civilian and military institutions, develop the economy, and create a stable central government. The policy of developing the economic and military infrastructure which started in the 1920s was pushed ahead in the 1950s more than ever before. Afghanistan as a newly independent country at the turn of century was mainly concerned with its domestic issues. The government was busy trying to unite the tribes, to institutionalize state power and bureaucracy, to organize a modern educational system, and to implement social and economic reforms. A few contacts were established with a limited number of foreign countries. This changed when Afghanistan signed its first friendship treaty with the Soviet Union on 28 February 1921. The treaty, which was signed by the Afghan delegation comprised of Mohammad Wali Khan , Mirza Mohammad Kahn , Ghulam Siddiq Khan, and the Soviet delegation comprised of Georgi Waselowich Chichrin and Mikhael Wich Qara Khan, confirmed the independence of both countries and guaranteed non-interference in the internal affairs of each other. The policy-makers in Afghanistan knew that political changes in Russia , the replacement of the Tsarist regime with the Communist regime, would not automatically guarantee Afghanistan ’s political and geographical existence and eliminate the Russian policy of expansion and political interference in South Asia . Therefore, they wanted to find friends and partners in Europe and the United States . In the interwar period, Afghanistan was pressured by both the Axis and the Allied countries for cooperation, but she averted these pressures by insisting on neutrality. To maintain her survival, to avoid being occupied by any power or country, and to maintain her independence, Afghanistan continued her policy of neutrality, which started in the reign of Amir Abdul Rahman at the end of the nineteenth century. Any shift toward the Soviet Union would have caused suspicions by Great Britain and vice versa. Therefore, the Afghan rulers of the nineteenth and at the early twentieth century checked the pressure of one neighbor by obtaining support from the other. Due to its remote and landlocked location, Afghanistan was of limited interest to the United States , both in geopolitical and strategic perspectives. In geopolitical terms, Afghanistan was perceived as strategically unimportant and in economic terms, Afghanistan was accorded minimal and limited importance. “This feeling of unreality, of an inability to focus or define American interests in this far-off land” has appeared “as a returning theme, and will explain the many inconsistencies of American diplomacy in Afghanistan .”  This uncertainty was caused by two major factors. There was a misperception about Afghanistan ’s geographic and strategic importance. Afghanistan was seen as unimportant, therefore not worthy of providing U.S. military and economic assistance. Afghanistan was recognized as being within the sphere of influence of Great Britain , which the United States did not want to offend. Second, there existed a lack of cultural understanding of Afghanistan in Washington . The American policy-makers and diplomats had a narrow vision and weak understanding of the cultural values and political affairs of the remote country of Afghanistan . As a result, whenever Washington took a policy action regarding Kabul , the American policy-makers did not make the attempt to decide on the optimal choice. Consequently, after World War II, due to Cold War competition, the arms race in the region, and the United States ’ military and economic assistance to Pakistan and Iran , Afghanistan ’s two hostile neighbors, Afghanistan ’s neutrality was tested and the country was pushed to tilt toward Moscow . Afghanistan ’s geopolitics on the other hand was influenced by its physical location, its politics and religion were influenced by ethno-linguistic division and religious ideology respectively, and its society was influenced by tribal groupings. Policy-makers in the United States failed to understand this construct and social fabric. American foreign policy decision- makers were reluctant to take a strong and decisive position on Afghanistan in large part because of Washington ’s inability to predict and assess the implications of its policies in Afghanistan . The policy-makers in Washington did not learn from their past experiences and the above mentioned trends still influence American foreign policy-making toward Afghanistan . American foreign policy toward Afghanistan continues to be influenced by ambiguity and tensions. The Bonn Agreement was orchestrated and signed in the shadow of these ambiguities and uncertainties. To overthrow the Taliban and to install a surrogate regime in Afghanistan , the Bush administration dealt with the same warlords and warring factions that were responsible  for the atrocities and civil war between 1992 and 1996. The United States provided these warlords money and weapons and promised them ministerial and gubernatorial positions. The United States made warring factions and warlords the rulers of Afghanistan and provided them military and financial assistance. The Bonn Agreement has empowered warring factions that have no interest in rebuilding Afghanistan , creating a sustainable economic infrastructure, and establishing a political system that is backed up by popular support. Furthermore, the current political and administrative structure is dominated by the remnants of the Northern Alliance ,  warlords, and an administrative and bureaucratic elite imported from outside. This structure does not allow the creation of independent social and political organizations that could solve social problems, political conflicts, and interethnic clashes in Afghanistan . The current political and administrative structure in Afghanistan places power and prestige into the hands of the same people who are undermining social, economic, and political progress in Afghanistan . After the September 11 attacks, the United States identified fighting terrorism as the guiding principle for foreign policy and its policy in Afghanistan in particular. The Bush administration emphasized that this policy can only be achieved militarily, thereby blocking the door to civilian elements who were not involved in terrorist activities. Its military solutions trampled negotiations and its counterinsurgency spawned more insurgents. This disposition to use military force and obsession to topple the Taliban regime indicates an ineffective method of diplomacy and a consistent lack of statesmanship. The obsession of the United States with defeating the Taliban and destroying al-Qaeda in Afghanistan is similar in nature to the United States ’ obsession with defeating the Soviet Union in Afghanistan . As in the case of Mujaheddin against the Soviet Union, the United States provided arms, materials, and finances to elements that are radical, guilty of war crimes and atrocities, and are hostile to American interests in the region. By providing money, military equipment, and training to the warlords, the United States has turned Afghanistan into one of the most heavily armed states in the region, one which will be difficult to disarm. The United States armed eventual enemies to combat the Taliban. The removal of warlords and local militias from power is an important and primary ingredient needed to establish security, peace, and law and order in Afghanistan . The United States was so preoccupied with defeating the Taliban and al-Qaeda that once again it did not see the consequences of its policy in Afghanistan . The policy makers in Washington believed that by removing the Taliban from power, the country would return to its normal condition and the civil strife would disappear. This was not the case. “Despite progress in the return of refugees and the prevention of humanitarian disasters, stability in Afghanistan is threatened by ethnic tensions, feuding warlords, and violence perpetrated by regrouping elements of the Taliban and their allies.”  As a result the seeds for a civil war in Afghanistan were sown. The United States ’ support of various warlords and of Hamid Karzai in the fight against the Taliban was not to help the Afghans build their country and establish a central and sustainable authority, but to find partners in its war on terrorism. To conclude this section, I argue that the United States policy objectives of defeating the Soviet Union in Afghanistan and ignoring the consequences of its military and financial assistance to the extremist elements of the Afghan Mujaheddin caused the Afghan civil war that took place between 1992 and 1996 and the current conflict we have on hand in Afghanistan. Similarly, to defeat the Taliban, the United States has provided financial, material, and military support to elements who were not interested in rebuilding Afghanistan ’s economy, implementing democratic institutions, and bringing law and order to the country. As the Soviet Union’s occupation of Afghanistan , the current American foreign policy and its occupation of Afghanistan has caused tremendous damage to the infrastructure, culture, and society of Afghanistan and has brought a real rift between the Afghans, the foreign forces and the Karzai government. American military actions in Afghanistan and allowing warlords and militias to dominate politics and the economy have created resistance and animosity against the Americans, the international forces and the Karzai government. In the war against the Taliban the United States’ reliance on second-hand information on the ground and the use of air power lead to large number of civilian casualties and enormous suffering of the people in each attack. The consequences of these incidents are detrimental and have proven that the United States , the Afghan government and the coalition forces are not winning the support and trust of the Afghan people. The SENLIS report on Afghanistan confirms this assertion. The mismanagement of the war against the Taliban and the lack of information and misinformation about al-Qaeda and the Taliban "has led to an over-reliance upon destructive air strikes, leading to increased civilian casualties and lower level support for the Karzai government and the West's presence in the country." In other word, the increasing recourse to air-strikes in densely populated areas, the lack of humanitarian assistance in areas affected by these air-strikes, and the “collateral damage,” i.e., civilian casualty and property damage, has brought the standing of the American, coalition, and Afghanistan ’s military forces to its lowest point. The forced-entry of American forces into people’s house, the imprisonment of innocent people in the name of al-Qaeda and the Taliban, the killing of innocent civilians through aerial bombardments and shootings on the ground, Afghan military and police abuse, corruption, extortion, bribery, and kidnapping have created mistrust and animosity against the Americans and other occupying forces, the Karzai government, and the warlords and their militias. The American invasion and the government of Hamid Karzai brought back the same kind of lawlessness, disorder, lootings, killings, and warlordism into Afghanistan that existed during the period of the civil war. 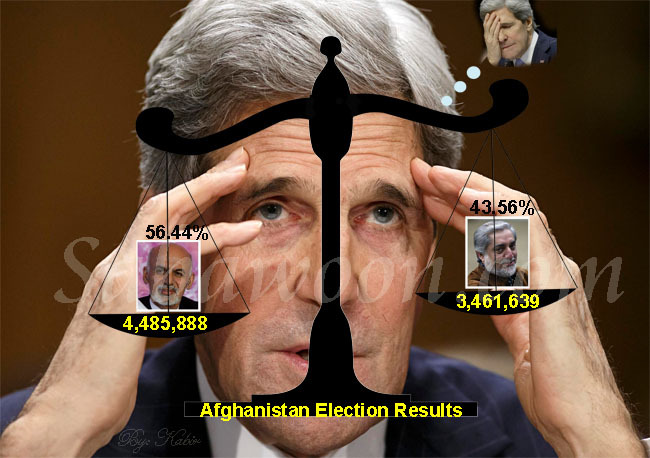 This is partly due to the fact that Hamid Karzai does not have any judiciary, military, and administrative powers. He is constantly compromising and making deals with different warlords, militias, and factions. He is not able to create an agenda that will help improve the conditions of the people and bring about a civil society. Afghanistan continues to remain a national security issue for the United States and the neighboring countries, because warlordism continues to rule the country with a heavy hand. The state apparatus, ruled by factionalism and warlordism, is the only source of political power and material privilege. Furthermore, the tribal affiliation, where treachery is penalized mainly by death, hinders the progress of fighting the remnants of the Taliban and al-Qaeda. According to The Economist, “ Southern Afghanistan , where the Taliban emerged, is still at war. America has killed thousands of enemy fighters there without seeming to reduce their number a jot. Indeed, with an increase in suicide and roadside bombs, their capability has improved.”  Part of the problem of this security dilemma is that the United States repeated the same mistake it made during the 1980s. The United States fought the Taliban’s extremism with warlords’ and militias’ extremism and militarism. The removal of the Taliban also deepened differences between warlords, technocrats, and the drug mafia, which hinder the establishment of a central authority and all the changes the Afghans hoped for. Power became distributed based on the abilities of individual groups mobilizing military support. The United States ’ uncoordinated and irresponsible military actions and their support of individual governors and militia groups reinforce the scenario mentioned above. The warlords and militias are re-establishing their fiefdoms, and continue to undermine efforts of consolidating democratic institutions and block venues that would make the creation of a pluralistic society possible. “The central government’s legitimacy has deteriorated. Sub-national government structure still lacks capacity. In their place, militia commanders and local mafia have filled the void, undermining local governance, democratic rights, and service delivery.”  Furthermore, the warlords and militias manipulate the process of democratic reforms and enhance their local power by subversion, threats, and intimidation. The poor security in the country will continue to exist and the economy would not develop and gain strength. At this point, Afghanistan does not have a national government that can unite the fragmented country, become self-reliant, and independent, and the United States military policy in Afghanistan is not helping to improve the situation. The few social, political, and administrative services that exist in the country do not serve the needs of the common people. They are at the service of the people with military and political power. The factionalism, which came as a byproduct of the American invasion of Afghanistan , continues to prevail. Consequently, the absence of a central authority, the existence of warlordism, the lack of security, and the weak economy allows the neighboring countries of Pakistan, Iran, India, Tajikistan and Uzbekistan, and other actors such as ISI, MISIRI, CIA and UNOCAL interested and involved in the war in Afghanistan and the carving out a sphere of influence, to meddle in the internal affairs of Afghanistan. As a result, the objectives of the intervention, i.e. human rights, democracy, and better living standards of the Afghans, which were explained by the German government “Das Ziel der Intervention,”  are not even seriously considered anymore. Unless military priorities are reconsidered, military engagements coordinated with the Afghan National Army, and a competent central authority is put in place in Kabul , Afghanistan will continue to suffer from war and poverty. Unless the Afghans are convinced that breaking with the Taliban was a right move and in their political and economic interests, the mistrust between the Afghans, their government, and the American and other foreign forces will continue. Even this, as we will see in the next section, has been a challenge. The September 11 attacks created new security challenges for the United States , but at the same time, the world showed great sympathy towards the United States and supported the American military campaign against the Taliban regime in Afghanistan , providing both military and financial assistance. The United States launched its war in Afghanistan to topple the Taliban regime and eliminate al-Qaeda. However, military intervention did not produce the results the United States expected. Even though the Taliban regime and al-Qaeda were defeated in Afghanistan , the country did not advance toward peace, security, and sustained economic development. Despite about 30 billion dollars aid money spent in Afghanistan , it still remains a war ravaged country. International forces did remove the Taliban from power, but they did not produce conditions necessary to return the lives of the Afghan people to normalcy. The country still suffers from a devastated economic infrastructure, weak government institutions, a lack of security, and an administration run through bribery and corruption. This is one of the reasons why the Afghans show open belligerency toward the government, which undermines the fragile political equilibrium established under foreign patronage. Furthermore, the people of Afghanistan are still waiting for the rule of law to be implemented and enforced in Afghanistan . In order to give legitimacy to an installed government, the United States hastily convened an emergency Loya Jirga (grand council), selected an interim government and a parliament, drafted and finalized a flawed constitution, and “elected” an incompetent president and a self-interest driven parliament. But the lack of political and administrative reforms, sustainable economic development, and responsibility and accountability has lead to the discrediting of the current regime and helped the reemergence of the Taliban in Afghanistan . In Afghanistan , law and order is broken down and the state has no monopoly on the legitimate use of force. The state is not able to protect its citizens. Instead, the state institutions are used by warlord and militias to oppress and terrorize the citizens. Once the United States had entered Afghanistan , the policy-makers in Washington , without realizing Afghanistan ’s political and economic realities, tried to implement a “ Marshall Plan ” for Afghanistan . It was suggested that the implementation of Marshall Plan-like policies would transform the economic, social and political structure of Afghanistan and would bring industrial progress to Afghanistan . But the policy-makers in Washington ignored the fact that “by the time Marshall Aid started to flow, in the spring of 1948, Western Europe was hardly a wasteland. Most of the region’s industrial infrastructure—electrical grids, water systems, roadways, railways—had already been rebuilt.”  The Western European countries possessed human, economic, and infrastructural capacities to rebuild their industries and political infrastructure. In contrast, Afghanistan’s minimal economic and industrial capacities that existed prior to the 1978 coup were destroyed by the war with the Soviet Union, the civil war between 1992 and 1996, the Taliban regime, and the American invasion of 2001. Furthermore, the above-mentioned liberal approach outlined very ambitious goals and commitments to Afghanistan without considering how the costs and expenditures should be paid. The United States defined its national interests in Afghanistan in broad, expensive, and idealistic terms, assuming that the necessary costs and risks would be taken by other countries. Instead of engaging with the local communities and launching development projects that reflected the communities priorities and needs, the Afghan government, international community, and the NGOs in Afghanistan waste money on cosmetic projects. Until now, the international community has spent enormous amount of resources on workshops on gender balance, human rights, capacity building, women rights, etc., which has created a rift between the people living in the cities and people living in towns. This is not to suggest that attention should not be paid to these issues, but it is more important to realize what consequences these policies have in Afghanistan . The pursuit of these policies and the manners in which they have been undertaken so far, has not created social harmony, but has further divided the society. Social harmony, gender equality, and other rights of human beings are better achieved through an evolutionary process rather than a revolutionary. This requires a long time and it is a social and cultural process that cannot be jumpstarted from outside through foreign dictation. According to a SENLIS report, "where implemented, international development and reconstruction efforts have been under-funded and failed to have a significant impact on local communities' living conditions, or improve attitudes toward the Afghan government and the international community." The United States and the international community has assumed that by promoting lofty purposes such as democracy, a market economy, and federalism, they will solve Afghanistan’s political and economic problems. They have ignored the consequences of thirty years of war, the applicability of Western benchmarks, and the perceptions shaping the social and cultural context of Afghanistan . The future of Afghanistan is placed in the hand of American and coalition forces, the NGOs, and foreign contractors and their agents in Afghanistan . The global coalition which was put together to help rebuild Afghanistan and establish a sustainable economy and political structure is wasting energy and resources on projects that bring little or no real political and economic change. To conclude, I argue that the American involvement in the affairs of Afghanistan has created a self-centered and self-interested president and legislature. Furthermore, current security and economic conditions in Afghanistan indicate that Afghanistan will not recover from the status of a failed state and will continue to fail to establish the security, law, and order needed for the implementation of the pipeline project. Afghanistan is a magnet for foreign powers. Therefore, due to its geographical location and the absence of security and weak economy, Pakistan, Iran, Tajikistan, Uzbekistan, Russia, India, Great Britain, the United States, and other countries interested in the political and economic affairs of Afghanistan will be able , to meddle in the internal affairs of this country and create the civil-war like situation that existed between 1992 and 1996. The hasty decision of the Bush administration and the global coalition fighting terrorism and the Taliban regime produced a governing structure which filled the political vacuum but did not establish a workable administration to respond to the security, economic, and social needs of the Afghan people. The new construct was the result of foreign pressure and an outside product which neglected critical local political realities and Afghan social and political tradition. The global coalition ignored the fact that thirty years of war and warlordism have resulted in the decline of the central authority, produced formidable chaos, and paralyzed the state structure. Furthermore, the United States and the global coalition were distracted by lofty ideas such as political pluralism, democracy, and federalism in a war-torn country that has based its political and legal practice through the mixture of customary and religious laws, and its political construct on a unitary political system. It is safe to say that creating democracy over night in a country that has gone through thirty years of destruction and devastation, and a country that does not have strong civil institutions to implement these values, was a utopia. To bring peace, stability, and sustainable economic development to Afghanistan and improve the living standards of the Afghan people, the United States , the international community, and the Afghan government need to bring an end to the fighting and agree with the resistance movements to achieve a political compromise. They need to bring an end to the continuous political and social misperceptions and military aggression. The Americans and the international community need to embrace a deeper understanding of Afghanistan ’s culture, traditions, social values, economic need, and political motivation. The United States and the global coalition fail to make the distinction between the Taliban and al-Qaeda. To be successful in bringing peace and stability to the country, they must recognize these differences and start open negotiation with the Taliban and other opposition forces. The continuation of the current policy is leading to the alienation of large portion of the population and increase in insurgency. To conclude, the few political and economic projects launched by the United States and the coalition forces in the past eight years did not bring any significant changes to the local political, social, and economic structure of Afghanistan . Political reforms, economic modernization, and social transformation are still waiting. In fact, the United States and the international community need to launch programs that will bring a revision to the U.S.-NATO military strategy, reform the Afghan military and security structure, launch an effective war against the drug mafia, criminals, warlords, and corruption, and transform the local economy in ways that it can provide jobs, increase the production of goods and services, and promote accountability. Tom Lansford , A Bitter Harvest: US Foreign Policy and Afghanistan ( Hants , England : Ashgate Publishing Limited, 2003), 71. Leon B. Poullada and Leilla D.J. Poullada, The Kingdom of Afghanistan and the United States : 1828-1973 (Lincoln, Nebraska: The Center for Afghanistan Studies, 1995), 9. Michael P. Sullivan , Theories of International Relations: Transition vs. Persistence ( New York : Palgrave , 2001), 42. Leon B. Poullada and Leila Poullada , The Kingdom of Afghanistan and the United States : 1828-1973 (Nebraska at Omaha: Center for Afghanistan Studies, 1995), 3. Wallace Murray , “NEA memorandum of conversation,” US National Archives, file 890h.00/122 (1930). A. Manan Aseer, “ Afghanistan in politischen Spannungsfeld zwischen den Grossmächten in den 1950er Jahren,” (Ph.D. diss., University of Hamburg, Germany, 1983), 109-110. Martin Ewans , Afghanistan : A new History ( Richmond , Great Britain : Curzon Press, 2001), 103. Ledwig W. Adamec , Afghanistan Foreign Affairs to the Mid-Twentieth Century (Tuscon, Arizona: The University of Arizona Press, 1974), 236. Wallace Murray , “The Chief of the Division of Near Eastern Affairs ( Murray ) to the Minister in Iran ( Dreyfus ),” Foreign relations of the United States , Diplomatic paper 1941/III (1959), 255. Ludwig W. Adamec , Afghanistan ’s Foreign Affairs to the Mid-Twentieth Century: Relations with the USSR , Germany , and Great Britain (Tucson: University of Arizona Press, 1974), 106. Abdul Samad Ghaus , The Fall of Afghanistan (New York: Pergamon-Brassey’s International Defense Publishers, 1988), 23-24. Richard Newell , “Foreign Relations,” in Afghanistan in the 1970s, ed. Louis Dupree and Linette Albert (New York: Praeger Publishers, 1974), 76. Atiqullah Nayebkhel , Qarardadhay Afghanistan ( Peshawar , Pakistan : Markaz Nasharaty A’rsh , 1379 A.H.), 58-63. Ted Rall , Gas War: The Truth Behind the American Occupation of Afghanistan ( New York : Writers Club Press, 2002): 9. Also See Lutz Kleveman, The New Great Game: Blood and Oil in Central Asia ( New York , N.Y. : Atlantic Monthly Press, 2003). Lutz Kleveman, The New Great Game: Blood and Oil in Central Asia ( New York , N.Y. : Atlantic Monthly Press, 2003), 3. NATO Online, Rome Declaration on Peace and Security,NATO Digital Library, http://www.nato.int/docu/comm/49-95/c911108a.htm, (Internet; accessed 23 August 2009). Paul Starobin, Catherine Belton, and Stan Crock, “The Next Oil Frontier,” Business Week Online,(MAY 27, 2002): 52-54, http://www.businessweek.com/magazine/content/02_21/b3784008.htm (accessed April 20, 2010 ). Michael P. Sullivan , International Relations: Theories and Evidence (Englewood Cliffs, New Jersey: Prentice-Hall, Inc., 1976), 67. Golbuddin Hekmatyar and his group was another party involved in the civil war between 1992 and 1996 but he was not part of the American alliance against the Taliban. Interesting point and why is that so? This is another discussion. The scope of this paper will not allow it to discuss it here. The Northern Alliance came to an end after the Karzai regime was installed in Kabul . SENLIS Afghanistan, Stumbling into Chaos: Afghanistan on the Brink, in The International Council on Security and Development Digital Library, http://www.icosgroup.net/modules/reports/Afghanistan_on_the_brink, (accessed September 5, 2009 ). Human Rights Watch, Killing You is a Very Easy Thing For Us in Human Rights Watch Digital Library, http://www.hrw.org/reports/2003/afghanistan0703/index.htm, (accessed July 25, 2009 ). N.A. , Taming Afghanistan's Badlands in The Economist Digital Library, http://www.economist.com/search/search. cfm?qr=afghanistan&area=1&keywords=1&frommonth=01&fromyear = 2006&tomonth=02&toyear=2006&rv=2, (accessed July 15, 2009 ). CSIS and PCR Project, Breaking Point: Measuring Progress in Afghanistan, in Center for Strategic and International Studies Digital Library, http://csis.org/files/media/csis/pubs/070329_breakingpoint.pdf, (accessed September 4, 2009 ). William Dowell , “Blowing Hot and Cold: 20 Years of US Policy,” in Afghanistan , ed. Edward Girardet and Jonathan Walter ( Geneva , Switzerland : Media Action International, 2004), 113. Derrick W. Brinkerhoff , “Introduction-governance Challenges in Fragile States: Re-establishing Security, Rebuilding Effectiveness, and Reconstructing Legitimacy,” In Governance in Post-Conflict Societies: Rebuilding Fragile States, ed. Derick W. Brinkerhoff ( London , Great Britain : Routledge, 2007), p. 4. CSIS and PCR Project, Breaking Point: Measuring Progress in Afghanistan (2007), in Center for Strategic and International Studies Digital Library, http://csis.org/files/media/csis/pubs/070329_breakingpoint.pdf, (accessed September 4, 2009 ). Sarah Lister and Andrew Wilder , “Subnational Administration and State Building : Lessons from Afghanistan ,” In Governance in Post-Conflict Societies: Rebuilding Fragile State, ed. Derick Brinkerhoff ( London , Great Britain : Routledge, 2007), 243. Leitartikel, “Das afghanische Trilemma,” Badische Zeitung , October 7, 2006 , http://www.badische-zeitung.de/ meinung/kommentare/das-afghanische-trilemma--16171789.html, (accessed September 5, 2009 ). Derick W. Brinkerhoff, “Introduction-governance Challenges in Fragile States: Re-establishing Security, Rebuilding Effectiveness, and Reconstructing Legitimacy,” In Governance in Post-Conflict Societies: Rebuilding Fragile States, ed. Derick W. Brinkerhoff ( London , Great Britain : Routledge, 2007), 2. The International Bank for Reconstruction and Development: A co-publication of the World Bank and the International Finance Corporation (2010), Doing Business in 2010: South Asia in World Bank Digital Library, http://doingbusiness.org/Documents/DB10_Overview.pdf, (accessed February 1, 2010 ). CSIS and PCR Project, Breaking Point: Measuring Progress in Afghanistan, in Center for Strategic and International Studies Digital Library, http://csis.org/files/media/csis/pubs/070329_breakingpoint.pdf, (accessed September 5, 2009 ). James Surowiecki , The Marshall Plan Myth in The New Yorker Digital Library, http://www.newyorker.com/ archive/2001/12/10/011210ta_talk_surowieki?printable=true, (accessed September 5, 2009 ). N.A., “Lost to a Vague Purpose in Afghanistan (2007),” News-Journal Online, http://nl.newsbank.com/nl-search/we/ Archives?p_product=NJ&p_theme=nj&p_action=search&p_maxdocs=200&p_text_search-0=Lost%20AND%20to %20AND%20a%20AND%20Vague%20AND%20Purpose%20AND%20in%20AND%20Afghanistan&_field_label-0=Author&s_dispstring=Lost%20to%20a%20Vague%20Purpose%20in%20Afghanistan%20AND %20date(all) &p_perpage=10&p_sort=YMD_date:D&xcal_useweights=no, (accessed July 20, 2009 ).